Bacchanal depicts the story about the god of wine in Greek mythology, Dinysus (Bacchus in Roman mythology). Bucchus buried his friend, who died in a duel. Then grapes grew in the cemetery. He pressed the grapes to extract the juice and put it into horned cups. This is what we call it wine now. Afterwards, he consecrated the sweet and delicate wine to the Olympic gods. Therefore, Bucchus became the god of wine. At the grape harvest time, Greek people would hold Bacchanal. Many painters expressed human passions by depicting the carnival scene that gods were drinking and dancing. Therefore, Bacchanal is not so much a gods carvinal as a real portray of young people rejoicing with wild excitement. In this oil painting Bacchanal, figures are bold, dissipated and passionate, which perfectly illustrates the warm and festive atmosphere. 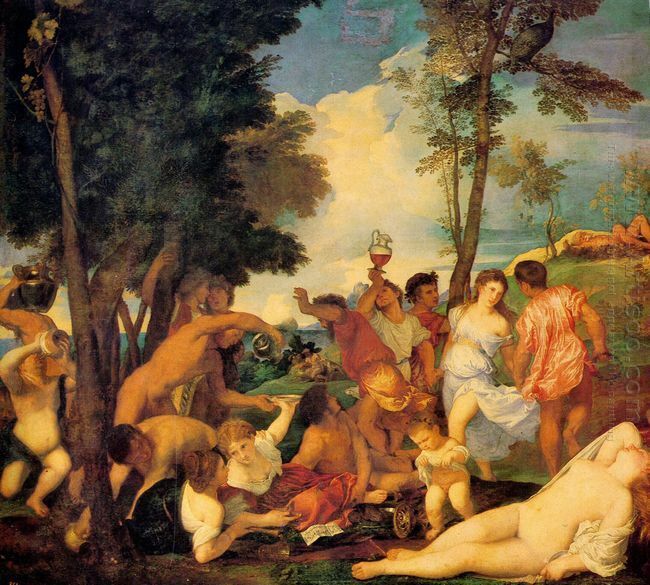 Some figures who are guzzling wine clearly reflect the impact of classical art on Titian. However, Titian attitude towards classical art is greatly different from Raphal. He considered classical mythology was a part of nature. People were not life-like sculptures, but are fresh-and-blood humans. Titian slightly idealized figures in this painting in order to make them transcend the reality of life, which convinced us that they belonged to a last golden age. In the lower right corner, a naked beautiful woman was lying on her back, which not only adapted to composition, but also embodied painter intention to sing the praises of sensual beauty of women. This posture was the inheritance and development of the style of Giorgione and it set an example for painters of different periods. The background is the beautiful Venetian scenery. The strong contrast between cold and warm color makes this Titan painting reproduction more poetic. Some figures are far while some are near, which creates an implicit and poetic effect and emphasizes the vivid scene of high jinks. Titian techniques in use of color and his priory on warm color shows he perfectly mastered oil painting skills. This new approach was consistent with his painting style, which enables him to create a series of art models which were highly harmonious between form and content.